With the rapid growth of new products, brand extensions and the blurring of traditional and new age advertising, marketing and advertising to target audiences has reached a new level of competitiveness. Brands now must adapt to this changing environment and contest with competitors to stay at the top of their market and target to audiences in creative, attention-grabbing tactics. The most iconic brand in the soda market, and throughout the world, is undoubtedly that of Coca-Cola. In the summer of 2011, Coke created an original marketing strategy to run a campaign that would inspire people to connect with the brand both online and offline in order to acclimate to the changing marketing environment. The campaign’s prime objective was to increase consumption of Coke over the summer season and to get people to fall in love with the iconic brand again. Particularly, in Australia, at the time nearly 50% of teens and young adults had never tasted a Coke and this drove the brand to reconnect with the country. Established in Australia, the ‘Share a Coke’ campaign immediately received positive media attention and consumer responsiveness. The idea of the ‘Share a Coke’ campaign was to place Australia’s 150 most popular names on the front of millions of Coca-Cola bottles, simple right? This was the first time in 125 years that Coke had made such a paramount transformation to it packaging, and it was revolutionary. The Coca-Cola brand wanted to initiate conversations by putting Australians front and center and inspire them to connect with people and ‘Share a Coke’. The central theme that gave ‘Share a Coke’ its power was the way a brand so universal could replace its logo with individual names by reaching out to consumers and personalizing its brand to individuals. -Lucie Austin, Marketing Director for Coca-Cola South Pacific. The ‘Share a Coke’ campaign strategically exhibited that when personalization in advertising is done the right way, it can be highly appealing and extremely effective. While Coke got personal, media was buzzing with talk over what the brand was implementing behind the personalization. Coke remained silent until Australia’s highest rated media weekend. The campaign was revealed to the public and aired across the biggest weekend in Australian sport, during the AFL (Australian Football League) and NRL (National Rugby League) grand finals which reached over 30% of the population. Succeeding the campaign launch, requests for more names were coming in the thousands. Coke was prepared for this boom of requests by setting up kiosks that toured 18 Westfield shopping centers attracting consumers to personalize any name on a Coca-Cola bottle. The multi-platform communications strategy was implemented to ‘Share a Coke’ with someone you know, or want to know and ultimately gave people the resources to find, connect and share. After 3 short months of running the campaign, young adult Coca-Cola consumption increased significantly in Australia by up to 7%, making 2011 Coke’s most fruitful summer season in history. The ‘Share a Coke’ campaign resulted in 76,000 virtual coke cans shared, 378,000 extra coke cans printed at kiosks, and 5% more people were drinking coke. Coca-Cola had successfully won over Australia and became a part of popular culture again. This method of advertising is very interesting and a great way to encourage brand loyalty early. I wonder why they haven’t tried this type of promotion in the US? This is an interesting advertising method. Since Coke is so popular in the United States, I never really think about the need for Coke to advertise. When I see the iconic, white, cursive letters and the candy apple red logo I automatically think of Coca Cola. I’ve never really considered that more aggressive advertising would be necessary in other countries where Coke is not as popular. I think of Coca Cola as being popular world wide, but that is not the case. I think that this advertising method was marketing genius. Making a brand as large as Coke on such a personal level had to have been a challenge, but Australia nailed it. 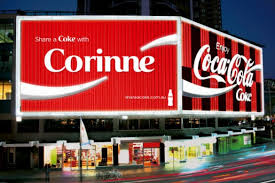 I think that people are more likely to try things when they feel that they’re connected to that brand, which they were when people were virtually sharing cokes and his or her name appeared on the screen. I think that this worked well because so many people haven’t tried a Coke in Australia, but I’m not sure how well it would work in the US because of its presence here. What a genius way to introduce your product into unknown territory. Clearly, Coca-cola knew the specific demographic they were trying to reach in utilizing social media and kiosks in malls to spread their campaign. I would attribute the success of this marketing tactic to having a clear understanding of their market and the means by which to reach them. Coca-cola is definitely the most iconic soda brand and they demonstrate their clever marketing skills with this new campaign. This inorganic word of mouth marketing managed to highlight their concern of the customer by bring thing them together and recognizing their individuality by personalizing their product. By personalizing their product through writing the names of thousands of different people and inviting those who shared the same name to share a coke and a story with each other was genius. It allowed for the customers to relate to each other and realize that the link between with was a great product, coke. This caught fire with social media and made the product even more popular virtually which reminded people about the product or for the many people in Australia who hadn’t tried the product, to open up a can. Good job Coca-Cola. I agree that Coco-Cola is the most iconic and well remembered brand in America, but forgot the expectations might not apply in Australia as well. The campaign strategy allowed the consumers to experience the product on a personal level. The advertising campaign was almost genius seeing that many people across the globe are perhaps not as familiar with the brand as Americas. Sometimes advertisers must look outside of the box to find a unique method that could potentially go viral. Coco-Cola took the product and encouraged people unfamiliar with the brand to try it out for themselves. This article was really interesting because it showed the power of advertising. I am not surprised that Coca-Cola created this advertising campaign but it is cool to see such a successful brand remain successful by utilizing advertisements. This is a good example of the stuff we have been learning about in IMC and shows that a good advertising team and product placement can really go a long way! Thats a very creative and interesting advertising technique. It makes one wonder why they havent attempted this in U.S. earlier. Coke was very popular in America but it seems as though its been adopted by numerous countries around the world. This is a very interesting article and I can’t help but think it is a genius advertising campaign. By playing on people’s want to be couragous and share, Coke is spreading even further. Slim Jim is trying the same thing with a lot less success.